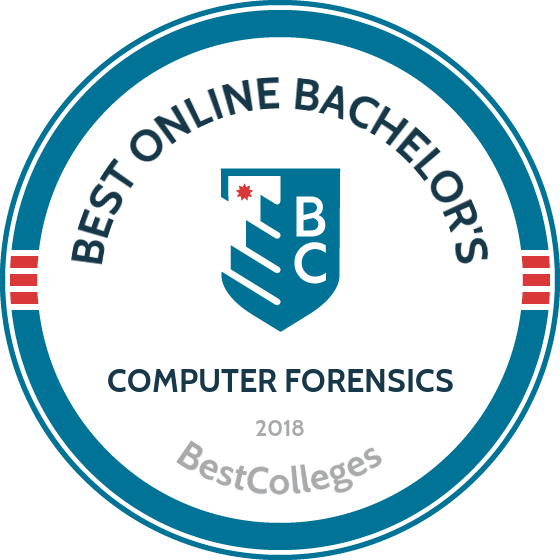 What Are the Best Online Bachelor's in Computer Forensics Programs? What Else Can I Expect From an Online Bachelor's in Computer Forensics Program? U.S. software company Symantec found in a recent security insights report that cybercrime affected 143 million Americans, costing them $19.4 billion in 2017 alone. Information security, a branch of computer forensics, deals with cybercrime involving computers and other digital storage media. Today, employment for these professionals continues to increase; the Bureau of Labor Statistics (BLS) projects 28% growth in the field between 2016 and 2026. As a computer forensics examiner, you will be at the forefront of investigations and court cases involving the recovery, collection, analysis, and presentation of digital evidence. Computer forensic science blends technology, scientific testing, and criminal justice. It falls under the broader scope of digital forensics, most often associated with the investigation of computer crimes. Computer forensics examiners or specialists respond to criminal cyber activity, such as fraud or espionage. Professionals in the field typically have a background in computer science. A bachelor's degree in computer forensics is a common way to gain skills and knowledge. Students earning a computer forensics degree online typically learn about both the technical and legal aspects of the field. While a computer forensics curriculum shares similarities with that of a cybersecurity program, there are important differences. Whereas cybersecurity focuses on prevention, computer forensics concentrates on what to do after crimes occur. Typical courses in a computer forensics program include cybercrime, cyber criminology, database design, and network security. A computer forensics degree online curriculum also explores cyber threats such as malware, investigative techniques, computer ethics, and cyber law. Keiser University-Ft. Lauderdale accommodates the needs of nontraditional students with multiple campuses and a strong eLearning program. The school enables holders of an associate in science degree in a computer-related field to upgrade their expertise with a bachelor of science in cyber forensics/information security. The program trains professionals versed in the technical expertise and investigative skills necessary to detect and thwart cybercrimes. The program includes upper-level general education courses in professional writing and management information systems. The 51-credit major focuses on technical competencies such as systems analysis, systems design, criminal evidence and procedures, database management systems, and security policies and disaster preparedness. Learner competencies include the effective use of information technology security tools and techniques to collect, preserve, and analyse evidence from the digital network. Graduates learn about the legal requirements for investigating and prosecuting computer crimes. Admission requires an associate of science degree and lower-level prerequisite courses. Educating nontraditional learners online since 1997, Champlain College offers comprehensive career-focused program options. Students enrolled in the fully online bachelor of science in computer forensics learn from faculty experts in cybersecurity and digital forensics. Students focus on the analysis and recovery of compromised data and learn how to detect how a breach occurred. The 120-credit curriculum includes a professional core focused on digital forensics analysis, networking fundamentals, operating systems forensics, digital forensics investigative techniques, and white collar crime. The online computer forensics course online enables students to earn certificates along the way in computer networking, Linux administration, and forensic accounting. Students engage in experiential learning using the school's state-of-the-art virtual labs. The NSA and Department of Homeland Security recognize the program as a Cybersecurity and Digital Forensic Center of Academic Excellence. Admission requires a high school diploma or GED and ACT or SAT scores. A private college near Pittsburgh, Robert Morris University emphasizes learning that includes professional-development experiences. As a leader in information technology, the school boasts a 124-credit bachelor of science in cyber forensics and information security. Faculty with real-world experience teach students about the security threats posed by cyber terrorists and hackers. The interdisciplinary curriculum incorporates technology, law, business, and organizational behavior. The computer forensics degree focuses on programming, operating systems, systems analysis and design, computer and network security, and database management. The cyber forensics and information security concentration explores cyberlaw, mobile forensics, evidence analysis, and IT security. In keeping with the school's experiential learning model, students in the computer forensics online program gain hands-on experience during a two-week seminar on national security in Washington, D.C. Admission requires a high school diploma or GED with a minimum 3.0 GPA and the SAT or ACT. A top Christian college, Regent University offers a 120-credit bachelor of science in cyber and digital forensics that prepares cyber defenders who approach their work from a Christian perspective. The online degree integrates courses in cybersecurity, digital forensics, and criminal justice. Learners study the legal aspects of cybersecurity with courses in criminal investigations, criminal evidence, and cybercrime and digital investigations. The computer forensics degree focuses on database fundamentals, operating system forensics, malware forensics, systems security, and network defense. Students take courses such as the Christian mind and Christian leadership as part of their development. Learners also become versed in the tools used to detect intrusions, and explore the collection, analysis, and preservation of digital data to be used in legal proceedings. Admission requires a high school diploma or GED and school transcripts. Pace University-New York offers a degree completion program through its 120-credit bachelor of science in professional technology studies with a concentration in computer forensics. Learners receive training for jobs in law enforcement, the private sector, or the government. The curriculum gives students a 20-credit IT foundation through the study of global networking technology, database management, computer security, and web authoring and digital media. The 20-credit concentration delves into computer file systems forensics, mobile forensics, crime and public policy, terrorism and society, and cyberlaw and evidence admissibility. Students generally complete the online computer forensics degree in a little over two years after transferring 56-64 college credits. Students may transfer up to 68 credits with a minimum 2.0 GPA into the program. The school may require students without enough transfer credits to take prerequisite courses in the arts and sciences via iPace. While curriculum details differ by program, all computer forensics programs offer a strong foundation in cybersecurity and teach students how to respond to threats. Students earning a computer forensics degree online may also need to complete an internship or practicum that gives them hands-on experience applying the skills they learn in the classroom. Core courses and electives normally differ between programs. Whereas one program may include a course on white-collar crime, another may offer an elective on incident response management. Most programs tend to cover criminal law and procedure. Below is a sample curriculum students are likely to encounter when earning a computer forensics degree online. Malware Forensics: This course addresses the threat of malicious software and the task of the forensic expert to identify the source. Students learn detection techniques and how to use analysis tools, such as reverse engineering, to understand what malware does and how it works. Topics covered include infection vectors, timeline construction, and volatile memory. Cyber Criminology: This course examines illegal activity in cyberspace and the individuals behind it, as well as the role of computers. Both social and behavioral sciences are applied to understand criminal motivations. Students study traditional and contemporary digital crimes, including system hacking, insider threats, cyber terrorism, ransomware, and white-collar crimes such as embezzlement and Ponzi schemes. Introduction to Cybercrime: This class presents concepts for conducting investigations in digital crime, particularly how to identify and preserve digital evidence. Topics cover how to provide testimony and how to detect criminal cyber activity such as fraud and identity theft, use of the hexadecimal, and hashing. How Long Does it Take to get an Online Bachelor's in Computer Forensics? A computer forensics degree online program typically requires the completion of 120 credits, which full-time students can complete in four years. Depending on the program and school, it is possible to transfer up to three-fourths of the required credits, reducing the program length to just a year of full-time study. Other factors that affect the length of a program include credit for prior learning, when classes are offered, and term length. Some programs allow you to complete the coursework at your own pace, while others place groups of students into a cohort. Cohort learning provides continuous peer support, but may take longer for some students since cohorts progress through courses as a group. When choosing a college or university, it is important to confirm its accreditation. For a school to gain accreditation, an accrediting body evaluated the school and found it met or exceeded quality standards. For prospective students, accreditation is assurance. The two types of accreditation in the U.S. are regional and national. Due to its history, as well as the types of schools that earn it, regional accreditation is regarded as the more prestigious institutional accreditation. Nationally accredited schools are often career-focused, for-profit schools with less demanding admissions requirements. Many regionally accredited institutions only accept transfer credits earned at another regionally accredited college or university, so transfer students should determine the accreditation status of their university before applying to another program. The U.S. Department of Education maintains a database of all accredited postsecondary institutions, and the Council for Higher Education Accreditation database includes over 7,600 learning institutions accredited by recognized U.S. accrediting agencies. According to the BLS, starting salaries for information security professionals are comparatively high for this in-demand field, and experts who also bring industry experience will have the best prospects. The table below features data from PayScale regarding expected salaries for computer forensics graduates at different stages of their careers. Note that bonuses range from $1,000 to $15,000, and profit-sharing may also affect bonus amounts. Upon completion of a computer forensics degree online program, new graduates can pursue various career paths in information security, including as cybersecurity consultants and computer network architects. The U.S. Computer Emergency Readiness Team notes that anyone who manages or administers information systems should possess a basic understanding of computer forensics. A computer forensics degree online program provides graduates with valuable analytical, computer science, and communication skills. Computer forensics and information security specialists can also earn certified information security systems professional (CISSP) certification. Below are a few careers you could pursue with a bachelor's in computer forensics. Information security analysts help organizations protect sensitive data from outside attack by devising and implementing security measures such as data encryption, firewalls, and simulating attacks to expose vulnerabilities. Computer and information research scientists help organizations solve complex computing problems, including improved information security. This level of expertise generally requires a master's degree in computer science or a related field. Also known as systems architects, a computer system analyst helps organizations run more efficiently through the redesign of current computer systems and operations. Systems architects work with IT to understand how changes to an organization affect security. Tests such as data modeling determine the best course of action. Computer network architects design and build data communication networks capable of next-generation networking, with an eye toward security concerns in the cloud. Network and computer systems administrators maintain the day-to-day operations of an organization's networks, including any changes made by systems architects or new protocols requested by information security analysts. As cybercrime grows, so too does the demand for professionals skilled in computer forensics. Students majoring in this new field find themselves in select company upon graduation. Remember that all scholarships have deadlines for application, so it is imperative that you get all information in on time. Students should also submit the Free Application for Federal Student Aid (FAFSA) to establish eligibility for federal grants, loans, and work-study funds.